l POSCO signs an MOU with Pohang – to develop Pohang’s Hwanho Park as a national landmark. l ‘With POSCO’ activities on the company’s Foundation Day included: tree-planting at Pohang’s Hwanho Park and soup kitchen volunteer in Gwangyang. On April 1, POSCO’s Foundation Day, the company carried on its corporate citizenship activities, this time by announcing a plan to develop Pohang’s Hwanho Park as a national landmark. Hwanho Park, also known as Hwanho Haemaji (sunrise) Park, was co-created by POSCO and the city of Pohang. 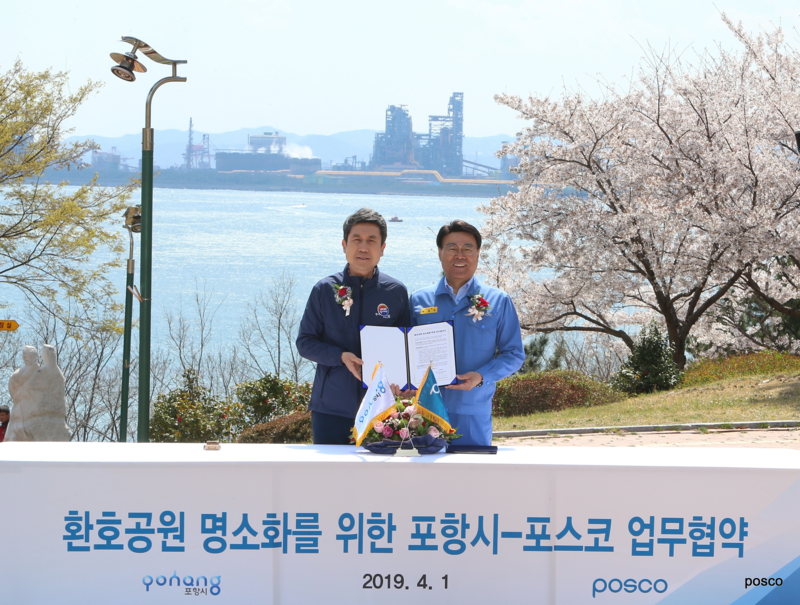 The company’s Foundation Day was made even more special as POSCO decided to implement one of its ‘With POCO’ principles –Society with POSCO– by signing a memorandum of understanding (MOU) with Pohang city. As per the MOU, the POSCO plans to commission steel art installations by top artists around the world to help establish the park as the city’s landmark. As for Pohang city, it plans to install cable car access across the ocean between the park and the city’s ferry terminal to provide a better connection to and from Hwanho. Pohang will also rearrange the park’s landscape so the visitors can fully enjoy the scenery of a nearby ocean as well as the famed Pohang Steelworks. As the two partners entered into the agreement, POSCO CEO Jeong-Woo Choi acknowledged that the MOU is a ‘significant corporate citizenship implementation’ as the Pohang’s cherished global steel company celebrates its 51st anniversary. The CEO further pledged the company’s full support towards the effort to nurture the park as a national landmark – the park will be a home to various sculptures that symbolize POSCO and Pohang’s mutual and sustainable growth. POSCO’s steels will become essential base materials for the artworks in Hwanho Park. To further commemorate the company’s Foundation Day, POSCO employees volunteered planting trees together with the employees of the Group Companies. They also put up steel nameplates for the trees. After the tree-planting at the park, the CEO Jeong-Woo Choi visited Pohang Steelworks and partners in person to offer words of encouragement and appreciation. On the same day, POSCO’s corporate citizenship endeavor reached beyond Pohang. The employees of Gwangyang Steelworks volunteered at the soup kitchen of the Nanum House – which means ‘house of sharing.’ As a measure to actualize its ‘Society with POSCO’ principle, Gwangyang Steelworks is directly involved in Nanum’s soup kitchen operation. Altogether 3,500 employees participated in the volunteer in the last year alone. Meanwhile, in the celebratory remarks, CEO Jeong-Woo Choi highlighted the company’s resolution to practice ‘deep listening’ via revitalized ‘Corporate Citizenship Love Letter.’ The CEO also plans to declare a ‘Corporate Citizen Charter’ – the timing of which is slated to be around the first anniversary of when the CEO initially unveiled POSCO’s new management principle, corporate citizenship. 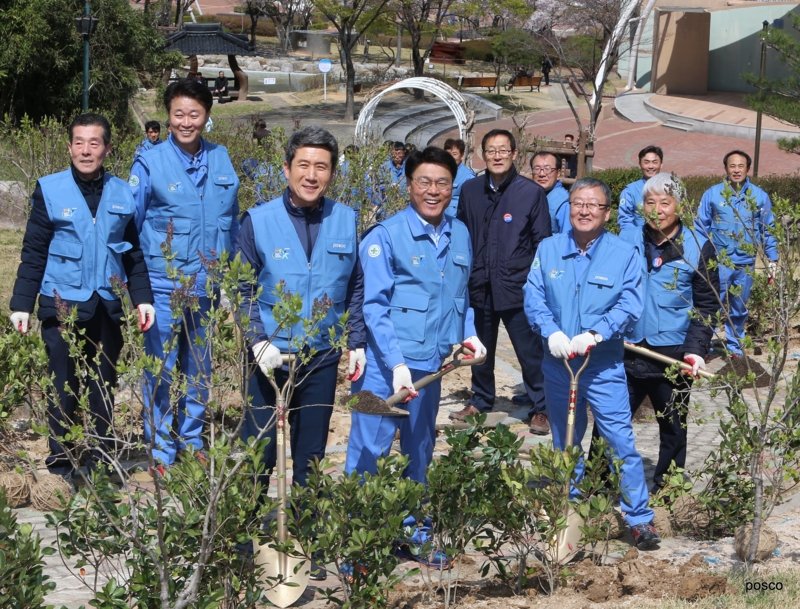 ▲ POSCO CEO Jeong-Woo Choi (fourth from the left) is planting trees on the company’s Foundation Day, along with the Pohang Mayor Kang-Deok Lee (third from the left) and the POSCO employees. At Pohang Hwanho Haemaji Park. 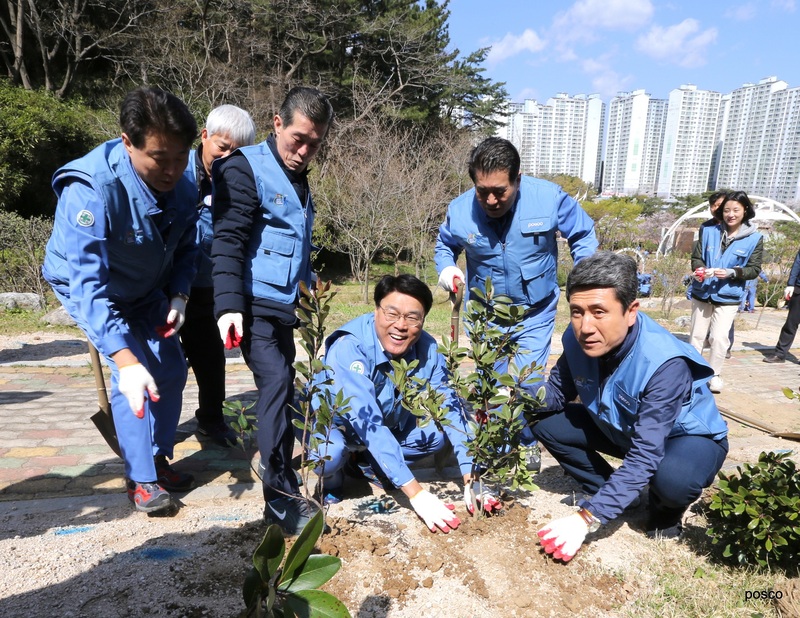 ▲ POSCO CEO Jeong-Woo Choi (seated on the left) with the Pohang Mayor Kang-Deok Lee (far right) at tree-planting in Hwanho Park .